Osinbajo meets northern traditional rulers – Royal Times of Nigeria. The consultative meeting between the Acting President, Prof. Yemi Osinbajo and traditional rulers from the northern part of the country, initially slated for Monday, will now hold Tuesday. Mr Laolu Akande, the Senior Special Assistant to the President on Media and Publicity (Office of the Vice-President), confirmed this on his twitter handle on Monday evening in Abuja. Akande, however, stated that the acting President hosted the traditional rulers to Iftar (breaking of fast) at the Banquet Hall of the Presidential Villa, Abuja. 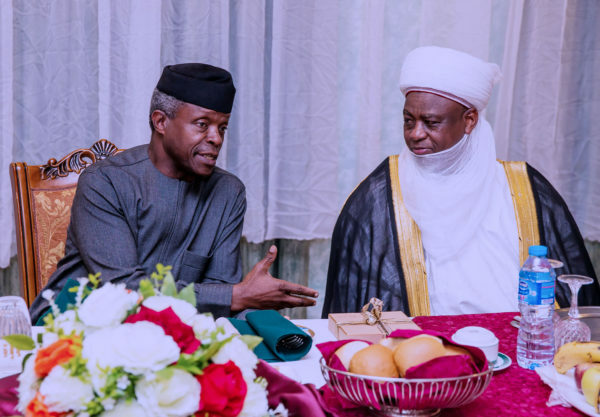 The Presidential aide said: “tonight, Acting President Osinbajo would be holding Iftar dinner with traditional rulers and tomorrow continues ongoing consultations with them. The acting president on Sunday in Abuja met with traditional rulers from the South East states of the federation. Osinbajo, at the meeting, expressed the hope that the royal fathers would continue to offer useful suggestions and the right advice to ensure that the country remained united. The acting president recalled that many Nigerians had paid the supreme price to keep the country united, saying that “it will be wrong for men and women of goodwill in this generation to toy with those sacrifices that had been made’’. He, therefore, maintained that men of goodwill must not tolerate any tendency that would drag the nation in the direction of another civil conflict.